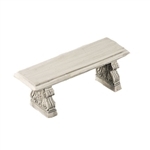 Great for your miniature patio or out-door scenes. Well made, good prices, includes patio sets, Adirondack chair, gliders, wicker sets, grills, yard tools including miniature power mowers, potting tables, birdhouses, mail boxes, lights, large swing set, double gliders, play stations. All in one inch 1:12 scale for the doll house yards and gardens.